Auto enthusiasts who prefer a coupe love the Veloster for its sporty but elegant appearance. However, there are many reasons why the Hyundai coupe remains a popular choice. The 2019 models are now available for viewing at Lithia Auto Stores. 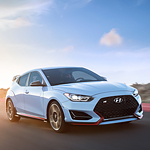 The Hyundai Veloster comes in five different models depending on your desires. Choices include the base 2.0, the Turbo R-Spec or the Turbo Ultimate. Your selection might include a premium sound system with eight speakers, the larger sunroof or the unique charging pad. Certain models also heighten occupant safety via blind spot, rear view and cross-traffic warning systems. If you desire a more sporty design, choose a model with a turbocharged engine combined with a performance-built suspension and upgraded steering capability. Investigate the possible combination of options available on the new models. Mix and match the features by seeing the Veloster at Lithia Auto Stores. Test the features during a test drive.